October brings us Halloween and all things sweet and green slime colored. So in the spirit of having something tea flavored that still fits the bill for a Halloween treat to enjoy at home, in comes Matcha Popcorn. This fun recipe is easy to make and we even added some chocolate drizzle. Start by heating the 2 tablespoons of butter in a large pan. A dutch oven is perfect but you can also use a 4 quart pan. You need to have the lid for the pan and oven mitts near by as you will be shaking the pan. Measure out the popcorn and have it handy to pour in. While the butter is melting, in a microwave safe bowl, melt the other 2 tablespoons of butter. Allow to cool on the counter while the popcorn pops. Once your butter on the stove has melted drop in the kernels and put on the lid and pick up the pan and shake it around. You are trying to coat all the kernels with the butter. Put the pan back on high heat and await the popping. While it pops, you will need to periodically shake the pan to distribute the kernels. You may want to crack the lid a little to allow out steam and reduce the likelihood of burning the popcorn. Once the popping reduced to less than 3 pops in 5 seconds, pull from the heat and remove the lid. Pour the popcorn out into a large bowl. Stir the matcha and 1/8 teaspoon of sugar and salt into the butter. You are looking to smooth out the matcha, no clumps. Once smooth, pour over the popcorn and stir the popcorn. 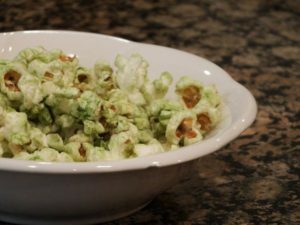 The matcha will transfer to the other popcorn kernels. Have a taste and then sprinkle on more salt and/or sugar to taste. You can also do this with microwave popcorn. If you are feeling industrious and have a spice grinder, you can grind down your favorite tea to a powder and substitute it for the matcha. It will give you an entirely different flavor of popcorn.